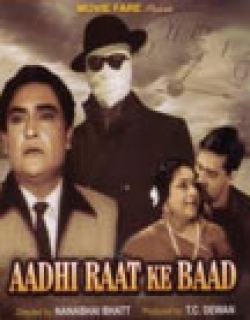 Aadhi Raat Ke Baad is a 1965 Indian Bollywood action, thriller, social film released on Jan 01, 1965. 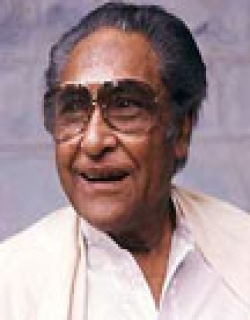 The film is directed by Nanubhai Bhatt. There were two partners of a Hotel in Rangoon. While Jamna Dass was away, his partner Ram Lal was murdered. Jamna Dass dashed to Bombay, where his daughter Nimmo had already gone. He made out a new will assigning the property to his daughter. He rang up Ashok to meet him. As he finished, he found his arrognat brother Jeevan face to face. An altercation then a sucffle and last a gun fire sound and there lay Jamna Dass dead. . Mr.Singh, his secretary, appeard on the scence with a tape recorder in his hand. A drama of black-mail starts. Both escape to Rangoon. Ashok comes over there and finds Jamna Dass dead. Frightened, he runs away. Soon, thereafter, Nimmo is kidnapped from her Hotel Room. Ashok & Murli fly to Rangoon after the culprits. A private detective, Ramesh suspects Ashok of the crime and folows him to Rangoon. There they come across Ragnii, the cousin sister of Nimmo. Aromance between Ragini and Ramesh and both join hands to trace the culprit. . The news of murder of Nimmo comes and Ragini inherits the whole prperty. Mr. Singh doubles up his black-mail of Jeevan and wants to marry Ragini. Suddenly the dead Ram Lal is found alive and a tussle starts between Ram Lal and Singh. Just at the moment, Singh & Ram Lal find Nimmo alive to tell the tale. Jeewan also comes there and Ashok and Ramesh too. Ram Lal was rounded up, but was he the killer or some one else. Check out this page for more updates on Aadhi Raat Ke Baad. This page provides latest and updated information about Aadhi Raat Ke Baad (1965) movie which released on Jan 01, 1965. Aadhi Raat Ke Baad (1965) is directed by , produced by , starring .We have also provided 2 trailers and videos, 2 photos, 6 user reviews, and 0 critic reviews.Aadhi Raat Ke Baad (1965) has received 2.3 rating from user reviews.The overall rating of Aadhi Raat Ke Baad (1965) is 45 and movie is 2.3.You can review, like, dislike this movie and also can add to favorites. You can also find information on showtimes, CDs, DVDs, online rental, online free watching.